According to family tradition, Lawson Calvin Edge first came to Houston County about 1870. Having been born in 1853 in Monroe County, Georgia, he returned there and on Dec. 22, 1874, married Susie E. Colvert and brought her back to Grapeland, Texas with him. To this union 5 children were born, but only three grew to maturity. They were Thomas Edward (b. 1878), Oscar (b. 1881), and Frank (b. 1891). Thomas E. Edge married Flora Garrett in 1898. To this union five children were born. 1. Grady E. Edge (b.9-16-1899) married Xemina Alice Harman (X. A.) on January 21, 1919. To this union 3 sons were born: Grady E. Jr. (b. 12-21-21) who married Francis Dominy on February 2, 1950. Grady Jr. and Frances had two children: Judy (b. 1-18-51) and Victor (b. 9-4-1965). The second son of Grady E. and Xemina Edge was Tueman 0. (B. 8-17-1923) who died in infancy. The third son of Grady E. And Xemina was Harman (b. 12-1-25) who married Jeanette Johnson on January 29, 1949. They had two children: Carina (b. 1-22-51) and Eddie (b. 12-1-54). 2. Annie Edge (b. 10-18-1901) married Johnny Powell on January 8, 1922. Their six children were: Madeline (b.8-10-1923), Johnnie Dell (b.9-18-1928), James (b. 7-15-1932), Reagan (b. 12-7-1934), Billy (b. 10-27-1936) and Jacqueline (b .8- 19-1939). 3. Lawson C. Edge (b. 8-8-05) married Shirley Meisenheimer on 9-1-1930. To this union, three daughters were born: Mary Lee (b. 8-28-31), Betty (b. 3-6-1935), and Glenda (b. 1-27-1953). 4. Charles Floyd Edge (b. 1-12-1910) married Letha Parker on January 25, 1928. To the union four children were born: Charles Floyd Jr. (9-9-1929), Wanda (b. 2-22- 1932) Frank (b. 1-24-1936), and Thomas Edward (b. 5-10-1947). 5. Mary Sue Edge (b.1-17-1915) married Grady Sheridan in 1934. To this union four children were born: Thomas (b. 1-13-1935), Nancy (b. 5-24-1936), Sue (b. 10-16-1938) and Sammie (b. 9-19-1942). 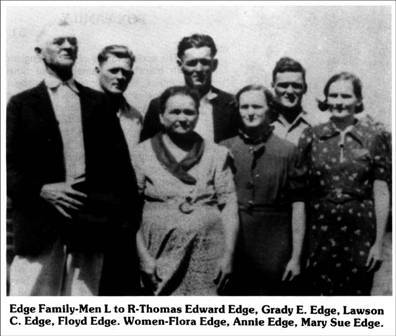 Thomas Edward (Ed) Edge was a prominent farmer and land holder in Houston County. He gave the land for the Enon School (1912) near the Shiloh Church across the road from the Davis Cemetery. In 1927 he sold the land for the Grapeland Country Club Lake. He continued to own all the surrounding land of the lake until his death in 1962. Several of his descendants live in Houston today. The second son of Lawson Calvin and Susie Edge was Oscar Edge (b. 6-21-1881) and he married Mollie Garrett. There was one child that died at age one year. Oscar Edge died on December 10, 1908. The third son of Lawson Calvin and Susie Edge was Frank Garland Edge (b. 6-21-1891). He married Mozell Oliver. There were no children. He died January 23, 1931.